Battleship looked like his sire, Man O’ War. This is a little known story that brings together a wealthy American heiress who was well ahead of her time, a small horse known as “the American pony” and a teenage jockey with talent, guts and gumption. Together they took on England’s greatest challenge, The Grand National Steeplechase otherwise known as Suicide Lane. Our story begins in the USA on March 19, 1927 at Walter J. Salmon’s Mereworth farm in Kentucky when a small chestnut colt foal was born to a mare named Quarantine, a proven producer. 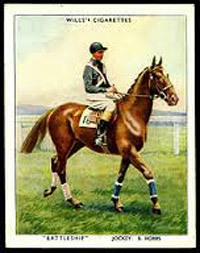 The colt’s father was none other than Man o’ War. Salmon was a big name in the world of thoroughbred racing, and a real estate magnate. He was also very interested in the early genetic theories of a Dr. Harry Laughlin. Between 1923 and 1932, he subsidized Laughlin’s research with well over $75,000 to find out more about the winning traits of thoroughbreds using Mereworth horse stock as examples. Wanting to produce a horse that carried American, British and French influences, the end result was the mating of Man o’ War and Quarantine. Battleship was the result, but he was small so he raced late in his second year and finished well back. But in his second year, he was victorious over other non winners over a distance of six furlongs. At three he raced eight times, won three, and finished in second place twice. After an injury in the Chesapeake Trial Purse at Havre du Grace, Battleship was used as a case study at the University of Kentucky with x-ray machines used as a diagnostic tool. The findings saw that the horse had an incipient small ringbone at the coronet band, something that could be fixed by trimming down the hoof toe and leaving the heel high and the use of a special shoe. Battleship was back in action as a four-year-old, winning six of his 12 starts, but sadly he went lame again at the end of the season and Salmon decided to sell him. You were a real superstar if they made cigarette cards with your photo. Now our story gets interesting. The First Lady of American Racing, wealthy heiress Marion du Pont Scott, had been winning hunt and steeplechase races with her horse Annapolis, another son of the mighty Man o’ War. The family farm was located at Montpelier Estate in Virginia, and she and her brother William designed many of the most famous race courses and venues of the National Hunt like Fair Hill, Delaware Park, Camden Race Course in South Carolina, and the races that took place at their own estate. 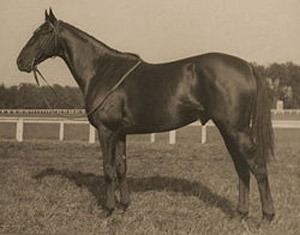 She wanted another horse with similar breeding as Annapolis, so late in 1931 a lame Battleship was delivered to the du Pont stables with the proviso that the $24,000 price tag would be paid half at first, and then the balance would be paid once the horse was rehabilitated and fit for hunting and steeplechasing. Credit goes to the du Pont blacksmith, J.E. Bell of Middleburg Virginia who spent six months using shoes and leathers to get the troublesome foreleg back in shape. Now Battleship was facing a career change, and this one involved jumping at speed. The du Pont’s trainer, Noel Laing was patient with the 15.2 hh horse who had been termed ‘lazy’ at some points in his life, and liked to do things on his own time, like getting up late in the morning! Battleship was a very careful jumper, but he soon learned to add speed to the equation and the little horse was showing promise as the results of his upcoming races over fences proved. The American Grand National is a long, tough challenge over 2 ½ miles with massive jumps that most would turn away from, but not Battleship. He won the race in 1934 despite carrying 147 lbs. because he was a stallion, and that same year walked into the winner’s paddock in the Malvern Hunt Steeplechase, Pimlico’s Billy Barton, and two more at Brookline. Sadly the horse went lame again, with a slight bow in a tendon and he enjoyed a long break at the du Pont stables in Montpelier. As he was recuperating Marion du Pont set her sights on even bigger fish across the pond, and this is where the third person in this interesting trio enters the picture. A man called Reginald “Reggie” Hobbs had trained for Marion du Pont in the past, and together they debated whether Battleship’s size would be a major issue against the normal 16 and 17 hand horses who raced in the British Grand National, her goal. She persisted, but said that the final decision would be left to Hobbs so on July 24th, 1936 Battleship and War Vessel were shipped to England to the Hobbs’ stable in Lambourne, England. Bruce Hobbs, Reggie’s son, took a shine to “the American pony” and together they trained and worked on “the gallops” in the Lambourne countryside together to build stamina and to acclimatize the horse to the environment. It was a partnership that worked wonders and Bruce campaigned the horse in 1936 and 1937 over “park courses” which were similar to American races. Battleship attracted a modest following of people who were delighted with his spirit and gumption despite his size, and he had five wins and two seconds to his credit. However, despite knowing that he had a game little horse on his hands, Hobbs’ was unsure if the horse could manage the bigger jumps and long course of the Grand National at Aintree, the grueling and infamous four mile, four furlong race with 30 jumping efforts. When race officials gave him a weight of 154 lbs. to carry, Hobbs withdrew the horse. The Dorothy Ours book: Battleship. Battleship was now 11 years old, but he was fit and happy so Marion du Pont pressed Hobbs to run the horse in the 1938 Grand National. She won over the trainer in the end. Battleship went to the start line at 40-1 odds, carrying an incredible 160 lbs. with none other than 17-year-old Bruce Hobbs in the saddle. Together could the youngest jockey to ever compete in the Grand National, and the smallest horse, the “American pony,” make history? They certainly did, and despite almost falling, the game little horse was just bursting to win. It was almost as if he knew that this win would make history. In fact, Bruce Hobbs never once had to bring out the whip, and although Royal Danieli, a front runner throughout the race, came knocking on the door right at the end, he could not defeat the little American horse. Marion du Pont who had a special place in her heart for this horse who gave it his all, could not bring herself to go to the winner’s circle, perhaps so overcome was she at his valiant efforts. Battleship lived out his days until he died at 31 at du Pont’s Montpelier Farm, and he remained one of her favorite horses. He sired just 57 foals probably because he was seen as a steeplechaser, and not a flat racer. He did sire three great steeplechasers: War Battle and Shipboard, champions of 1947 and 1956 as well as a horse called Sea Legs who won the American Grand National in 1952. These horses were gelded so the Battleship line died. 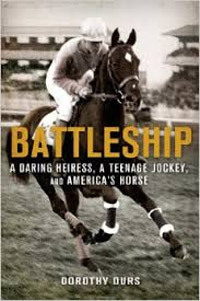 In 1969, Battleship was inducted into the Horse Racing Hall of Fame.